It’s really, really hard to find a good protein bar. One that contains a reasonable amount of protein, is low in sugar, reasonably low in carbohydrates, and high in fiber. Oh, and actually tastes good! 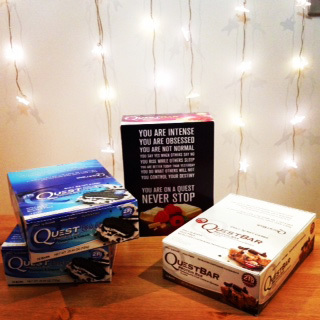 Enter Quest bars. The average Quest bar contains 180 calories, 21g of protein, 1g of sugar, 17g of fiber and less than 5g of net/active carbs (I’ll discuss this more below). And don’t even get me started on how good the Chocolate Chip Cookie Dough tastes. While macros and taste (hello chunks of chocolate!) are important, I’m also very conscious of the ingredients I put into my body. One ingredient that stands out when we look at the label of Quest Bars is isomalto-oligosaccharides (IMOs). IMOs are being used more and more and, fueled by the “low-carb” claim made by Quest Bars, are the subject of many debates within online nutrition communities. I’m a big believer in being critical of food labels and non-scientific opinions on the web. It’s frightening how many times I’ve noticed major discrepancies in the macro breakdown on food labels that are likely leading hundreds of people astray. And, on the flip side, it’s frustrating when misleading information deters people away from great food! So with all that in mind, I want to bring together some of the important information about IMOs, particularly their use as a fiber source in Quest Bars. What are IMOs & why are the used? Isomalto-oligosaccharides are simply products of starch once it has been broken down. Starch is the most common carbohydrate in our diet and is made up of lots and lots of glucose (sugar) units. When starch is broken down, the result is smaller carbohydrates. If you’re keen on learning all about the details behind this process, check out some of the awesome videos on Khan Academy. IMOs are one of these products of starch breakdown and their sugar units are connected by bonds that are resistant to being broken down by the bacteria in our gut. So what does this mean when we consume them? Well, this means that when we consume IMOs, they are mostly left undigested and thus not broken down into sugar molecules for us to then absorb. I say mostly because these types of bonds between sugar molecules are not easily broken down, however some may be broken as they pass through us. While there are some claims out there that state that IMOs are unnatural, they are actually naturally-occurring in quite a few foods including honey, miso and soy sauce. When IMOs are indeed created, they are created in a way that is simply a manipulation of a process that already occurs. Essentially, the starch is broken down into those smaller carbohydrates I mentioned earlier. These carbohydrates will be comprised of glucose molecules that are connected to other glucose molecules. To make IMOs, the glucose molecules that are connected to other glucose molecules by easily-broken bonds are further altered by enzymes so that they are instead connected by those hard-to-break bonds. Most of us are pretty familiar with fiber. Fiber is simply the undigestible component of the food we consume. Foods that contribute fiber to our diet help us maintain a feeling of fullness and aid in healthy gastrointestinal processes. The key to fiber relative to this discussion relates to the former point: whatever the source, fiber increases the volume of the food we consume without contributing significantly to calories and this is what leaves us feeling full and satisfied. So the idea behind IMOs is that they’re ideally made up of carbohydrates that are hard to further break down, meaning they are acting as a fiber source without adding much in the way of calories and sugar. I’m confused! Why does the number beside carbohydrate not match the “net/active carb” claim on those Quest Bars? Here we can see that the overall number of carbohydrate grams listed is 21. However, 17 of these grams are listed as coming from fiber. Normally, we can simply minus the fiber grams from the carbohydrate total and the remaining carbohydrate number is closer to what we are actually obtaining (this is not entirely accurate, as some intended fiber may be digested. But it’s pretty close). In this case, Quest is telling us that our carbohydrate source, the IMOs, are also going to be largely undigested, so we are meant to minus those 17 grams of IMO fiber off of the total carbohydrate number. So for simplicity let’s minus it all off like Quest does and say that we only have 4 grams remaining. If we look at the label again, we can see that one of those grams comes from Erythritol. Erthritol is an artificial sweetener that our bodies mostly (there’s that pesky word again!) excrete without breaking down. So for the sake of this discussion and for the same reason, we can minus this 1 gram off of our remaining carbohydrate number. This leaves us with that “net/active carb” number of only 3 grams. Quest is telling us that there are 3 grams of carbohydrates that our gut bacteria do break down for our bodies to digest. Are the Quest Bar people lying? Now this question isn’t so easy to answer. As we saw with that little label exercise above, it doesn’t look like the Quest Bar people are taking into account that some of those additional carbohydrates will likely be broken down and this will contribute to a higher number of “active/net” carbohydrates. Now I am by no means saying that this number is wrong. it’s possible that the IMOs in Quest Bars are so unlikely to be broken down that the amount that is ends up being so small that it is justified to ignore. So, where does that leave us? How do we know if those IMOs are unlikely to be broken down? How confident can we be that we really are only obtaining 3 grams of carbohydrates? The answer would depend greatly on the length of those carbohydrates in the IMO mixture. As we discussed above, those glucose molecules connect together to form carbohydrates. And these carbohydrates can be different lengths depending on how many individual glucose molecules are connected together. Now remember how I’ve said that those hard-to-break bonds are just that, hard (but not impossible) to break? Well, the shorter the carbohydrate chain, the closer the carbohydrate is to becoming a glucose molecule. In other words, if we have a short carbohydrate made up of only two glucose molecules, then we are only one bond-break away from having a single glucose molecule that our body will then take in and use or store. Conversely, if we have a long chain (made up of say, 10 glucose molecules), then we are many bond-breaks away from a single, usable glucose molecule. So if those IMOs contain shorter carbohydrates, they may indeed be broken down and used. 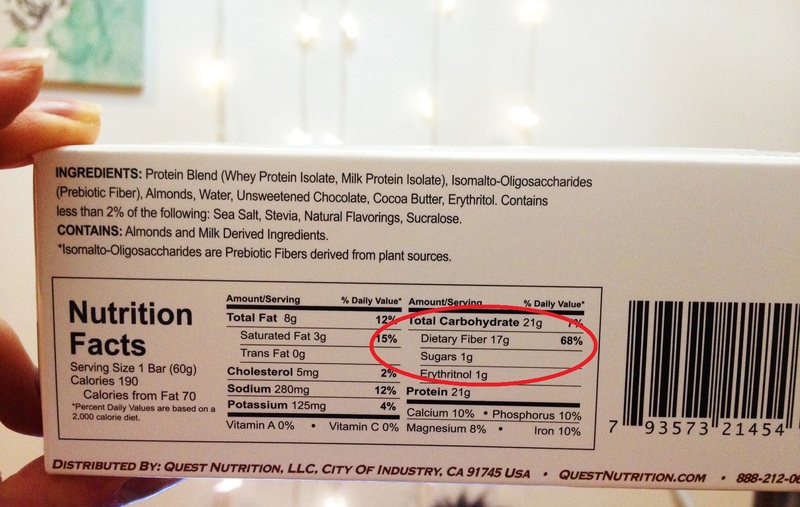 But before we jump to the conclusion that those Quest Bar people are fooling us, we need to look at that nutritional label again. If we look at the ingredient list, it’s hard to say where those 3 active carb grams are coming from. 1 of those grams is accounted for as a sugar, but we don’t know from which ingredients are contributing these carbohydrates. What I’m trying to get at is that the Quest people may be accounting for the partial digestion of some of those IMOs by listing these net carbs. Unfortunately, as far as I can tell we don’t know whether or not this is the case. Ultimately, my research on IMOs in general leaves me with the understanding that they are partially digested (which means that they count as a carbohydrate source). However, it is unclear to me if Quest Bar labels account for this. Furthermore, the extent to which this occurs depends largely of the length of those carbohydrates found in the special IMO mixture that Quest uses. For now, we will have to see how these claims develop and be critical of the science that claims that support and refute them. So where does this leave me. Should I be eating Quest Bars?! Yes! Eat those Quest Bars. But be mindful that your body may be getting more than 3 grams of carbohydrates out of them and you may not be getting all those fiber grams. Look at it this way: even if every single one of those IMOs were digested (now the research is clear that this is NOT true, but let’s go with it for a second), the total number of carbohydrates you would obtain from a Quest Bar would be 20 grams (we will let the sweetener go off undigested in this argument). As far as I’m concerned, that delicious bar packed with all of its protein and chocolate chunks is worth those 20 grams. And if you ask me, that’s a well-rounded snack! I always try to eat fruits, vegetables and fish before I reach for a bar, but healthy eating is all about balance. If you want more information, start off by checking out the Uk Food Standards Agency. That document contains a ton of info, as well as the references to some relevant scientific studies to get you started. Thanks for this. I’ve been looking for a clear-headed explanation of this lawsuit for a while. And thanks too for the Khan Academy link! What a wonderful resource. Love this blog. The best analysis I’ve seen so far on this topic! Clear and simple and with the only sensible conclusion!